Bernie Goldbach in LSAD-Clonmel with logo from Evernote. ONE OF THE TOP apps for Windows Phone is Evernote. And it doubles as an audio recorder for Audioboo. A lot of people don't realise the power the Windows Phone mic offers. Out of the box, it has decent audio recording capability and I've used the audio recorder to make clips inside Evernote that I can email directly to Boomail. I also use Voice Recorder Pro on Windows Phone 8 to get the highest quality .wav file from my Nokia Lumia. That app uses time and battery power to pull the HQ audio file from my Lumia 820 into the app's mail client. I email the audio into my Evernote first, listen to it, then add an image to the note in Evernote before sending the whole lot out via Boomail. I haven't tried recording more than four minutes at a time because .wav files are huge. However, after four different attempts, the result has always worked. The audio files and associated image goes up onto my Audioboo account. 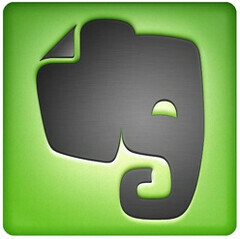 I'm going to start a board on Audioboo where I hold my Evernote Audioboo collection. Another note maker also exists on WP8. It's OneNote. You can create a file in OneNote, type in notes, add your photo for cover art, hit the audio button at the bottom to insert a voice clip and your're onto the same process. However, you cannot append with OneNote like you can do with Voice Recorder Pro. I'm keen to prove this Evernote-to-Audioboo concept for our next batch of creative multimedia students because most of the incoming cohort are part of the BYOD Brigade.